Poliomyelitis, commonly known as polio, is a highly infectious viral disease that can cause irreversible paralysis. Polio mainly affects children under the age of five. Most infected children do not produce symptoms but can still spread the virus and cause potentially fatal cases. According to the World Health Organisation, polio cases have decreased by almost 100 percent since 1988, from an estimated 350,000 cases to 39 reported cases in 2016. Unless the virus is eliminated it will continue to spread, particularly in conflict zones and other areas where displaced people live in unsanitary conditions; the perfect conditions for the re-emergence and spread of the disease. Polio has been identified recently in countries like Syria and Somalia, both of which were thought to be polio-free. Supportive therapy can be given but there is no cure for paralysis. However, polio infection is preventable with vaccination and is essential to the global eradication of polio. 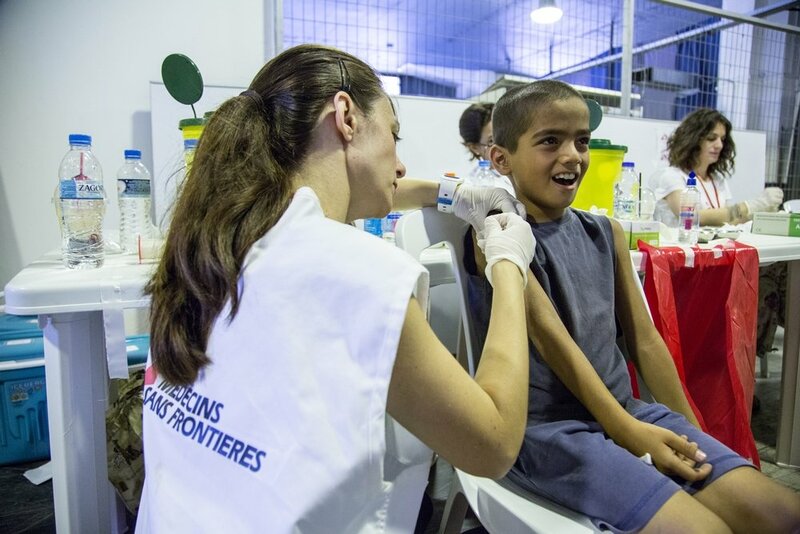 A young boy receives a vaccine from an MSF member of staff. The polio virus can be caught from contact with an infected person. The virus enters through the mouth and multiplies in the intestine, spreading around the body by entering the bloodstream. In some cases the virus can also infect the central nervous system, multiply inside nerve cells and destroy them. This leads to paralysis of the limbs, most often the legs. Of those people that develop paralysis from polio up to 10 percent die due to their breathing muscles failing. Most people do not develop symptoms but can still spread the virus to others. Typical symptoms are: fatigue, headaches, vomiting, stiffness of the neck and pain in the limbs. These symptoms often go away on their own and people make a full recovery. Around one percent of polio cases cause paralysis of the limbs, and sometimes the breathing muscles. There are two types of vaccine available for prevention: oral polio vaccine (OPV) and the inactivated polio vaccine (IPV). If enough people in a community are immunised, the virus will be deprived of susceptible hosts, preventing its spread and therefore dying out. OPV is easily given, safe and provides potentially life-long protection. The vaccine also produces an immune response in the intestine, making it effective in preventing transmission of the virus within communities. IPV is given in four doses as an injection. It is more expensive than OPV, produces a lower level of immunity, and does not stop transmission from person to person. OPV had therefore been the vaccine of choice in many countries. However, because the oral vaccine contains attenuated (weakened) polioviruses, on extremely rare occasions, use of OPV can result in cases of polio. For this reason, as soon as a country has eradicated wild polio transmission (polio cases not related to OPV), it is asked to stop using OPV in its routine immunisation programmes. In general, a bit of comfort is enough to make them forget the ordeal. Weak health systems and infrastructure, conflict and poor sanitation have interfered with the eradication of polio in these countries. Coordinated immunisation planning and high vaccination coverage is needed to stop the transmission of the virus within these countries and spread of the virus to others. Eradication strategy consists of not only vaccination programmes but also surveillance to find and report cases to be able to monitor potential polio outbreaks and provide immunisations.